You are here: HomenextNew contributionsnextRoad Names of Laindon 2. Further to Ken’s article on ‘Laindon Road Names’, other roads in Laindon were named after monarchs. King Edward Road, Victoria Road, Alexandra Road. Also, King’s Road and Queen’s Road. 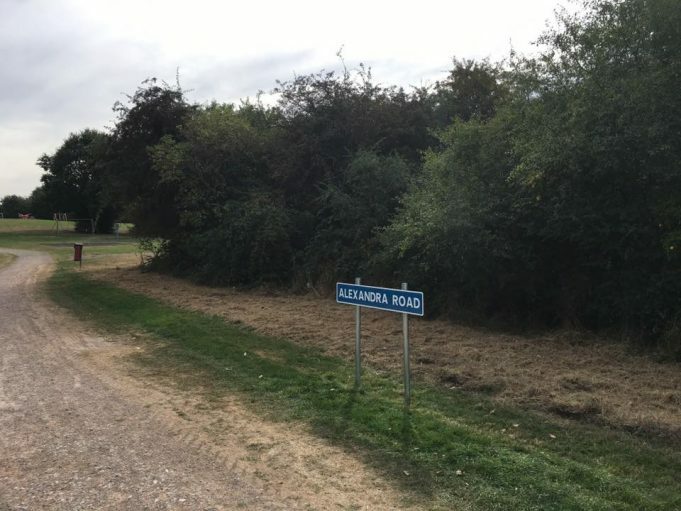 Many of the upmade roads in Laindon weren’t signed (including ours) which must have been very difficult for the postmen. We lived in Alexandra Road, but for ease of postal deliveries, it also became known as the extension of the unmade section of King Edward Road. In recent years, a road sign has at last been made. There were those named after counties and towns. Devonshire Road, Somerset Road, Norfolk Road, Norwich Road, Suffolk Road, Essex Road, Worthing Road, Gloucester Road. Sandringham Road, Leicester Road, Cambridge Road, Inverness Road, Balmoral Road, Windsor Road, Stirling Road, Preston Road, Cromer Avenue, Cumberland Road, Northumberland Road, Rutland Road, Preston Road, Berwick Road, Ulster Road, Lancaster Road, Douglas Road, Buckingham Road, Hertford Road and Bedford Road. There were road names connected with the Armada (although the road sign writer misspelt the name as ‘Almada’). Rayleigh Drive, Spencer Avenue, Drakes Avenue, Lord Burleigh Drive, Earl Essex Chase, Darnley Avenue, Borthwick Drive, Woolbrook. This area became a park, but has been replaced by the Redrow estate in Lee Chapel North. North Laindon had roads named after places in Africa. Kimberley Road, Pretoria Avenue, Kennelworth Road. Waverley Road and Durban Road. A small area off Basildon Road had roads named with a royal association. Windsor Court, Palace Court, Westminster Court, Queen’s Court, Prince’s Court. Roads with Boar War associations. Ladysmith Avenue and Colenso Road. The King Edward Road estate has several ‘Meads’. Mead being short for Meadow. Home Mead, Mellow Mead, Bushy Mead, The Mead, Briar Mead, Brook Mead, King Edward Mead. Some roads in Langdon Hills were named after poets and playwrights. Shakespeare Avenue, Shelley Avenue, Milton Avenue, Radcliffe (Anne Radcliffe – poet), Russell Road, (George William Russell – poet) and Gladstone Road (William Ewart Gladstone – poet). There must be many more that I haven’t mentioned.